I'm excited to be linking up with Fabulous in First for her Sunday Smorgasbaord linky party. We had a nice family weekend!!! I love 4th of July. Here is me and my family! Our house is FINALLY finished! We have grass, landscaping, and I finally got my wreath on my door. Now I just need to get the inside decorated!!! 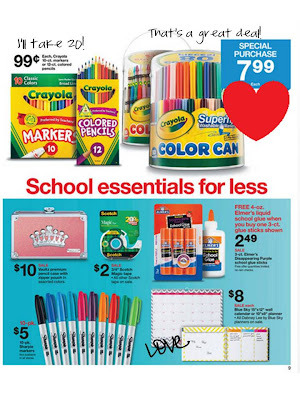 Um....look what I saw today in Target's ad! That is a SUPER deal on the color cans! Also, markers for 99 cents! I usually buy 20 of those then when Crayola crayons go to 25 cents I buy 40!!! Oh! The chevron calendar! EEEK! Y'all I am STRAIGHT UP addicted to school supplies. It's an ugly addiction. So supposedly we are getting wifi (in like 5 years...we live in the COUNTRY). Apparently my room is the hotspot. Do you see where they placed that puppy? Yup...right in the middle of my WORD WALL!!!!! WHAT??????????? There is my randomness for this week! I have only 3 full weeks left and it's back to work for me! Sniff, Sniff! You didn't really use that word wall, did you? Ha! That's funny that it's a random placement on the wall for a random blog post. We are "supposedly" getting wifi, too. I'm not holding my breath! Your house looks beautiful and I CANNOT believe they put the hotspot THERE!?! Are you kidding me?! My room is also the 'hub' for my hall. Last summer they took down one of my bulletin boards and placed a huge black box, about 3 foot square, right in the center of the wall towards the ceiling, which is a dropped ceiling. If I stand under this box my head is just a couple of inches below it. Several times a month someone from the IT department will come into my room, open this box and begin work on one of the many components contained within. Did I mention they do this WHILE I'm teaching?! Our school system's tech guys are pretty lame, but I will give them credit; they put ours on the ceiling! Oh man right on the word wall!! Obviously the person who put up it is not a Kinder teacher!! Will you move your word wall? Congrats on getting WiFi on the the positive side! Great for wifi, but like above ours are all the the ceiling since it is easier to run lines and drops. I am happy to have a hub in my room this year, the student network could drag in my old room. Oh and I am totally heading to Target tomorrow now :-) I need those color cans! Your house is beautiful! And I am totally heading to Target also!!! Your house is gorgeous!! I love it...SOOOOO pretty! Target....oh what great deals!! I know just how you feel! My fire alarm and clock are in the middle of my bulletin boards. In addition, my OLD tv sits right in the middle of my alphabet! Come on!! Your home is beautiful. I'm a new follower! Oh my goodness; your house is beautiful! That is too funny (and so annoying) that they put that in the middle of your word wall!